Today, I'm liking Joss Whedon again. I didn't know feminism was actually a thing until I left home and found out the country didn't run the way my mom's house did. So I have this goldfish, idiot, forgetful thing in that every time I'm confronted with true misogyny, I'm stunned. I'm like, "Really?" That's like, "I don't believe in airplanes." It's like, "What century are you from?" I don't get it. Joss Whedon once again comes through with a great metaphor or two. I think I just like this quote from his interview with Vulture because it's exactly how I first reacted to feminism. When you grow up in a "post-feminist household," for lack of a better term, the catcalling, less-pay, all-pink-everything world seems very strange. Should Idris Elba receive an email from me, there might be an attitude of scold. 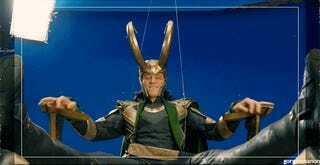 And because he's hinted at in the article, I think it's perfectly appropriate to throw in a Loki Approves gif. Because I'm sure he does.